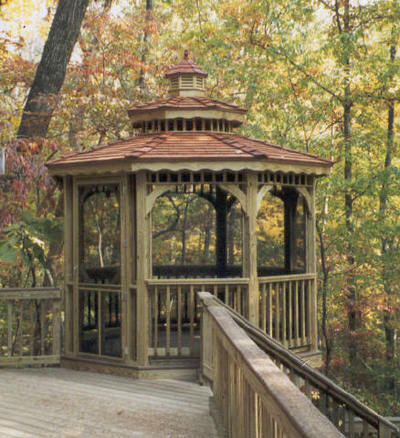 Outdoor gazebos have been used as decorative structures for thousands of years, dating back to Egyptian gardens. Gazebos were commonly built in the shape of a hexagon or octagon and placed in a remote corner of an elaborate garden. Gazebos became notably popular in the U.S. during the second half of the 1800s. Gazebos were often built for Victorian style homes with sprawling yards and ornate gardens. 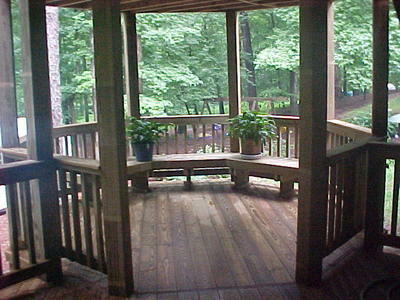 The image of a gazebo became associated with elegance, romance, comfort. 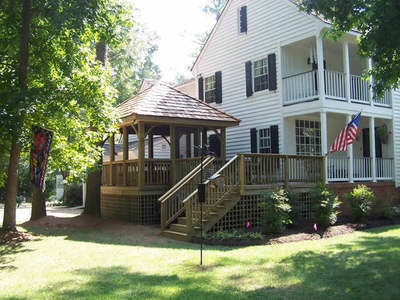 But today, a gazebo can be fully customized to complement any home and backyard. The gazebo is not just a garden structure any longer: the gazebo has evolved as an extension of other outdoor living spaces such as a deck, porch or patio, adding appeal and value to your home. Gazebos are practical, attractive, cost-effective and fun! Today’s gazebos are used as a bistro for morning coffee or evening dessert, as an impromptu picnic site or functional garden shed, a changing room for a pool or spa, or even a child’s playhouse and spot for kids sleepovers. 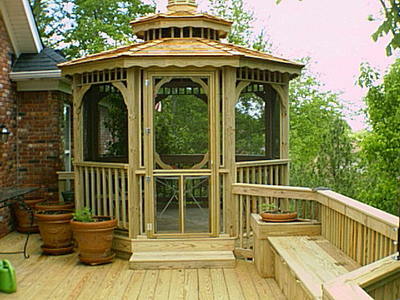 Contemporary gazebos are built with a variety of materials including wood, hardwood, composite and vinyl. Screens are easily added to a gazebo for extra protection from the elements. Accessories such as built-in benches and lighting increase the gazebo’s versatility too. Gazebos have always been picturesque structures… a respite with a view. Nowadays however, a gazebo — just like a screened porch – becomes the favorite backyard spot for family and friends to hang out. And gazebos designed and built by Archadeck, are versatile and can be completely customized to fit your lifestyle and budget. Screened gazebo or open gazebo? You’ve got plenty of choices! 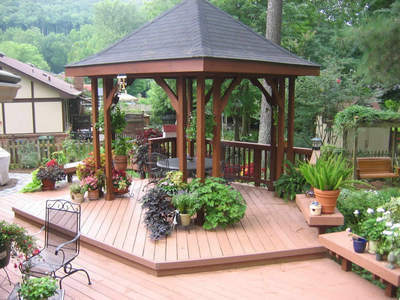 Click here to see Archadeck projects including gazebos, porches, pergolas and decks throughout St. Louis and St. Charles in Missouri. « Decks We Build. Decks You Live On.